So while we still have a few months before tomatoes are plentiful and flavorful, cherry and grape tomatoes are starting to come into season now. With a quick sauté of garlic, onions, balsamic vinegar, and fresh basil, they create a luscious and flavorful sauce. And use that sauce to top salmon? You have a pretty amazing meal. We've been eating a lot of salmon lately, and this was definitely a great preparation for it. The rich, buttery flavor of the salmon plays really well off of the deep, slightly sweet flavor of the sauce. It reminded me a bit of this chicken with tomato-herb pan sauce, which is also a favorite dinner around here. I broiled the salmon, but you could certainly cook it on the stovetop or grill as well. I served this with a side of roasted asparagus, and called it a day. So while I'm still yearning for summer and tomatoes, this dinner will hold me off until the time comes. Preheat the broiler. Line a baking sheet with foil, and arrange the salmon fillets in a single layer. Lightly brush each fillet with olive oil, then generously sprinkle with salt and pepper. Broil the salmon for 8-10 minutes, or until it is lightly browned on top but still translucent in the center (you can use a butter knife or fork to test). Remove from oven, cover with foil, and allow to rest until it's ready to serve. Meanwhile, make the sauce. Heat 3 tablespoons of the oil in a medium sauté pan set over medium-low heat. Add the onions and cook, stirring occasionally, until very tender but not browned, about 5 minutes. Add the garlic and cook 1 more minute. Stir in the tomatoes, 1/2 teaspoon of salt, and 1/2 teaspoon of pepper. Cook over medium-low heat 10 to 15 minutes, stirring occasionally, until the liquid evaporates and the sauce is thickened. Remove from heat and stir in the balsamic vinegar and basil, being sure to scrape the browned bits off the bottom of the pan. Taste and season with additional salt if needed. 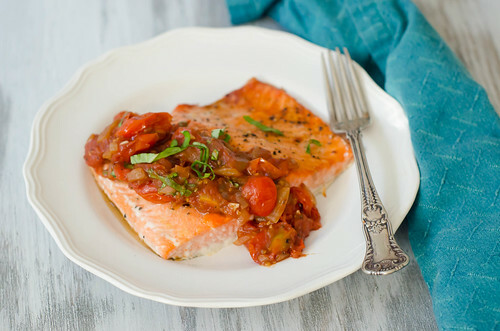 Spoon the tomato sauce over the salmon and serve. I guess it's no coincidence then that I've started to crave cherry tomatoes!! This really is the perfect fresh-flavored salmon topping! Oh how I love garden grown tomatoes. This recipe looks so amazing. I can't wait to try it. Pinning it to my fish board. The John Denver reference---I don't know if it was him but I remember a song that went something like this.."ain't nothing like love and home grown tomatoes... (I just googled it, actually "two things you can't buy, that's love and homegrown tomatoes." Great memory. Those tomatoes! I want some pretty fiercely! Just made this tonight. YUM! Thanks for sharing, Josie.